Customized Didi 29 Retro with cruising gaff rig. This design was commissioned by a client who likes the concept and features of theDIDI 26 but wanted a more classic appearance. 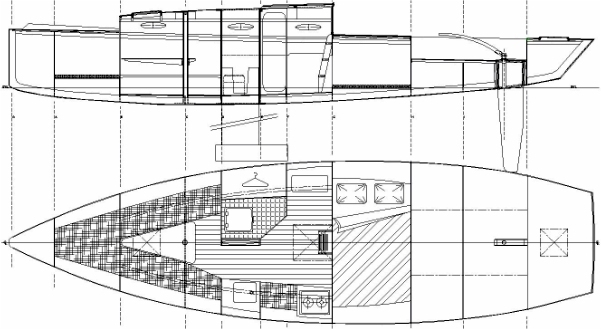 He plans to build it himself in Hout Bay, South Africa from a kit supplied by CKD Boats. 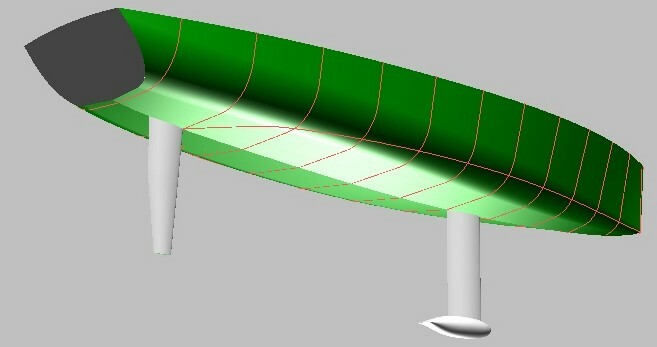 3D images of Didi 29 Retro with cabin as designed. 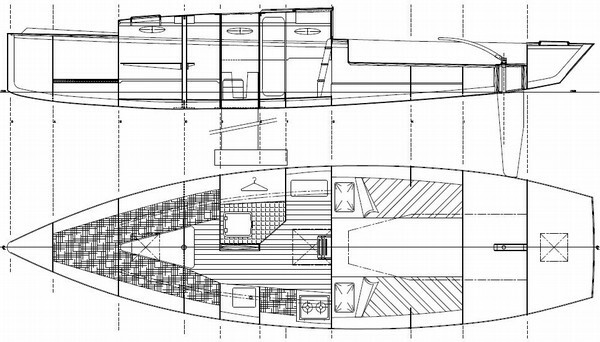 Long cockpit version, with quarter berths. Short cockpit version, with double berth. 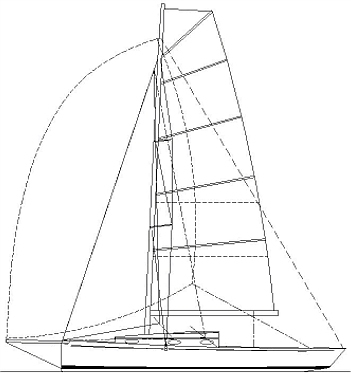 In March 2013 we added a smaller cruising gaff rig for this design. It retains the same basic configuration as the bigger rig but with all spars reduced in length. The mast is shorter only in the topmast, staying unchanged from the hounds down to deck level. The effect of this is to reduce the I dimension of the asymmetrical but not of the headsails. 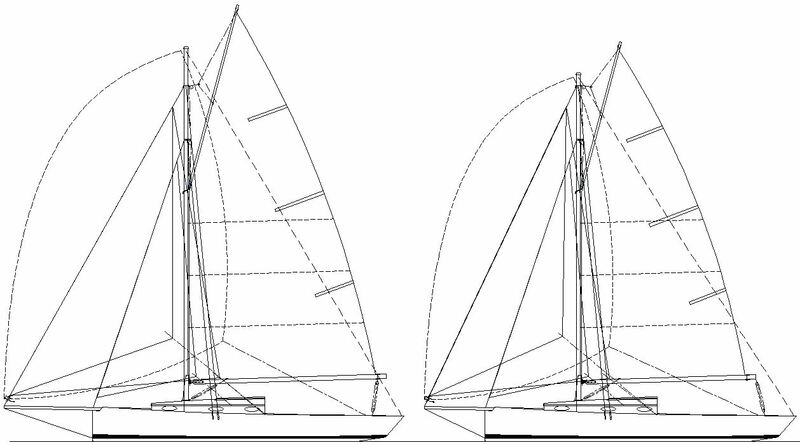 The bowsprit is shortened to reduce the P dimension for both the asymmetrical and the outboard headsails (Genoa and Yankee), so all three of these sails become easier to handle. The main has retained the same luff length but the head, foot and leech lengths have all been reduced. 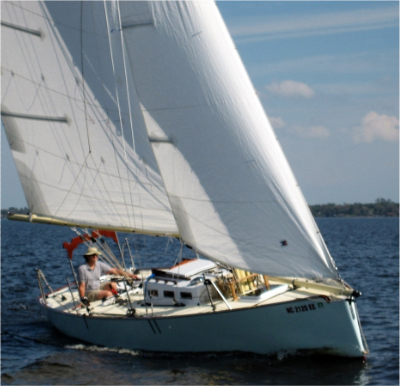 The only sail that remains unchanged is the inboard headsail, which serves as a staysail with the Yankee or as a working jib when the bowsprit has been stowed. In May 2014 we added another rig, the squaretop Marconi rig shown at the top of this page. This rig will be more comfortable for those who have no experience of gaff rigs and want a more modern option. It has been said that the modern squaretop rig is the updated equivalent of a traditional gaff rig. 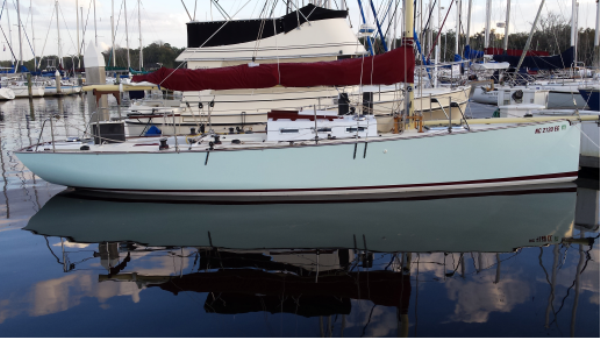 Certainly, it looks better on a classic hull than a "leg 'o mutton" mainsail does. In fact, I prefer the look of the squaretop rig to either of the gaff rigs on this boat and it would be my own choice. Click here to view the list of drawings for this design or to read an article about radius chine plywood construction. Two gaff rigs, racing on the left, cruising on the right. This design has metric and imperial measurements.